As the number of older Californians increases so do the incidences and allegations of elder abuse. We help parties involved in disputes over elder abuse allegations reach a resolution which both sides can accept, avoiding potentially emotionally-charged, time-consuming and expensive litigation. Mediation allows both sides to control the resolution of the dispute instead of taking the risk of an unfavorable outcome at trial. Elder abuse can include physical, financial, emotional and sexual abuse; exploitation, neglect, and abandonment. Abusers can include the person’s children, other family members, and spouses as well as staff at nursing homes, assisted living facilities, home health aides, and hospital employees. Elder abuse cases are especially emotional for all parties. One side sees a vulnerable elder being taken advantage of and suffering due to the intentional acts or neglect of a heartless person. Family members may feel guilty about the incident because their choices may have resulted in the elderly family member being exposed to the accused abuser and their failure to protect the family member from abuse. The other side may feel wrongly accused of actions they would never actually commit. Family members may accuse each other of abuse in order to control the older family member and who may simultaneously benefit from inheritance under estate plans or trusts. Healthcare providers may feel they’ve been unfairly targeted by family members seeking to benefit financially from conditions that are simply the result of a natural aging process or accidents, not abuse or neglect. The older family member is at the center of this dispute. He or she may be suffering serious, debilitating physical conditions, dementia, and psychiatric disorders. Putting such a person through a potentially arduous and invasive litigation process, especially if family members are on both sides of the dispute, places additional stress and strain on the person at a time when he or she may be least able to handle it. 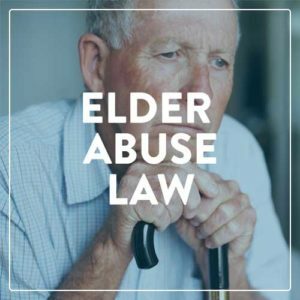 Many of the claims of elder abuse are brought under the Elder Abuse and Dependent Adult Protection Act, also known as EADACPA or the Elder Abuse Act. A plaintiff endured a prolonged hospitalization as a result of injuries he alleges were sustained at the defendant’s nursing home. Plaintiff claimed he was routinely denied adequate fluids and nutrition, left sitting in soiled diapers for long periods of time and the staff failed to monitor and notify his physician of significant changes in his condition which deprived the plaintiff of needed medical care. The plaintiff developed a urinary tract infection and ischemic colitis resulting in septic shock. Plaintiff was a 93-year-old resident in the memory care unit of the defendant’s facility. An incident occurred at the facility one night when another patient entered the plaintiff’s room and proceeded to assault him. The plaintiff was injuried and hospitalized for five days until the plaintiff was deemed stable enough to travel to a long-term care facility. At the long-term care facility, the plaintiff’s injuries required feedings by tube. The plaintiff passed away shortly after from cardiopulmonary arrest, multi-organ failure, and pneumonia. Plaintiff was transferred to the defendant’s facility following electroconvulsive therapy treatment for depression. The plaintiff also had other diagnoses including diabetes mellitus. Plaintiff alleges that staff at the facility, including the doctor, mismanaged a hypoglycemic event which resulted in plaintiff’s death. Plaintiff was a 55-year-old nursing home resident who used the call button for assistance to get to the bathroom. While in the bathroom, the CNA received another call and left the plaintiff alone. The plaintiff fell and was found on the floor at a 45-degree angle and bleeding. The plaintiff was not taken to the emergency room and was placed back in bed. Plaintiff contends that the defendant’s facility failed to comply with the standards of practice, its own nursing policies and procedures and care plans to minimize plaintiff’s risk of falls and injuries. Plaintiff was a 75-year old resident sexually assaulted in a long-term care facility. In addition to claims of elder abuse, plaintiff claimed that the defendant’s facility failed to conduct background investigations of employees. Mediation is a confidential, alternate dispute resolution method where a neutral third party guides both sides to an outcome they can both accept. Time, energy and expense can be saved when elder abuse cases are resolved fairly with the consent of the parties as opposed to leaving the outcome up to a judge or jury after a full trial. Steve Mehta is one of the foremost mediators in California, and is one of only a few mediators who has experience litigating elder abuse cases from beginning to end. He has lectured nationally on this topic and is routinely considered one of the top mediators in California for elder abuse litigation matters. He is familiar with not only the issues involved in these cases but the family and emotional dynamics that come with them. Steve Mehta has extensive experience with elder abuse cases, both as an attorney and an independent mediator. He is familiar with not only the issues involved in these cases but the family and emotional dynamics that come with them. Contact his office today to learn how he can help parties resolve allegations of elder abuse and the harm that resulted.